Although it sits on the edge of the Arctic Circle, Iceland is far from a frigid wasteland of ice and snow. As one of the most active volcano spots in the world, all that geothermal heat keeps things pretty warm. Through its natural duality, Iceland is ever-increasing in popularity as one of the best tourist spots for natural beauty hunters. Visitors can discover fantastic landscapes such as rugged fjords, hot springs and glaciers that have nourished Iceland's glory in the past and the present. Fancy a trip to the spa for long soak and a day of beauty? Well, Iceland has a lot of proper spas like that, but so does every other country. 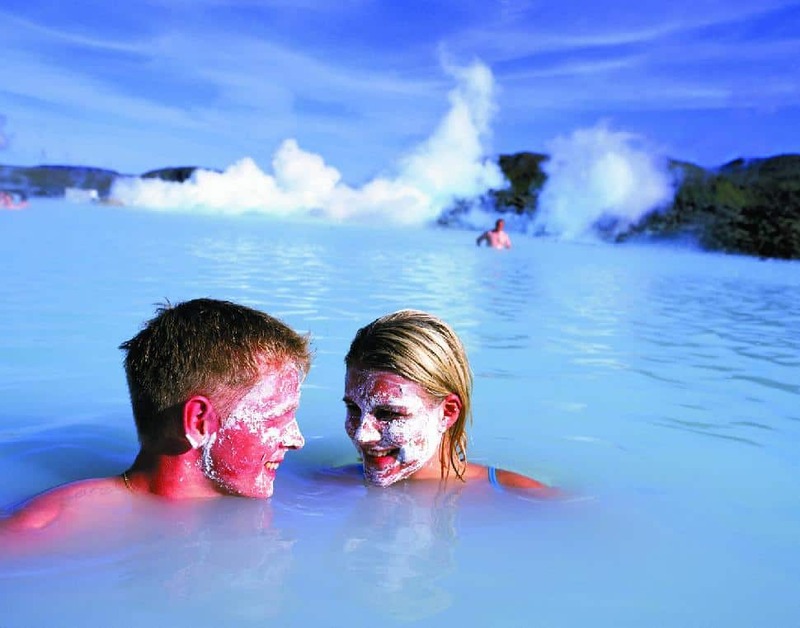 For the most stunning Iceland spa experience, visitors will want to head up to the Blue Lagoon. Although man-made, this series of massive outdoor crystal clear pools is heated to a toasty 40 degrees centigrade by geothermal energy. Operated year round, the Blue Lagoon is one of the few places in the world where visitors can naturally soak in hot water while being surrounded by ice and snow. Like most natural hot springs, the water is enriched my minerals from the earth that provide relief to a number of ailments. However, unlike most natural hot springs, its restorative properties are rarely a focus. The Blue Lagoon lets it's ethereal coloured warm water do it's talking more so than its mineral content. Even for those that fight off the urge to get in, the Blue Lagoon is still worth stopping by and staring at. The aquamarine waters set across the backdrop of dark black mountains and green rolling hills present a glaring contrast that has led to it being one of the most photographed sites in Iceland. Iceland formed right on the spot where the American and Eurasian continental plates meet, which is thought to be responsible for its number of active volcanoes. However, it affords visitors to the island a unique opportunity. 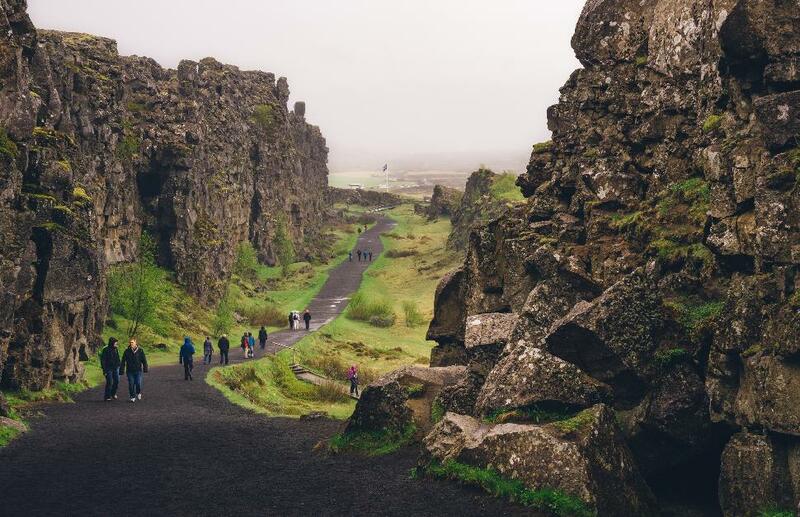 Through the Almannagja Canyon, visitors can actually walk through a portion of the rift left in the country where the plates collide. Located in Thingvellir National Park, the Almannagja Canyon is an experience of a lifetime. Due to the friction caused by the plates, the park and canyon within experience multiple earthquakes a day. While many go unnoticed in the park's highlands that allow views of the rift from above and right on the lip, visitors are sure to feel each one in the canyon. It is, however, still perfectly safe, most earthquakes fail to ever be stronger than a 3.0 magnitude. Regardless, it is not every day that explorers have an opportunity be on the very seam of where our world comes together. No trip is complete without a trip to the beach. However, located two hours south of Reykjavik is the odd black sand beaches of Vik. Formed by volcanic rock and ash, the black sand beaches of Vik look like the literal end of the world. Even though it's almost always too cold to swim or sunbathe, Vik has yet another obstacle preventing visitors from having the usual beach time experience. Vik happens to be the wettest town in Iceland, even if it isn't raining, there is likely to be a thin fog over the black sand. Regardless, the striking black sand and black basalt columns set on a backdrop of green rolling hills is certain to leave an impression. Iceland's Strokkur Geysir in the Haukadalur Valley is one of the most persistent geysers in the world. 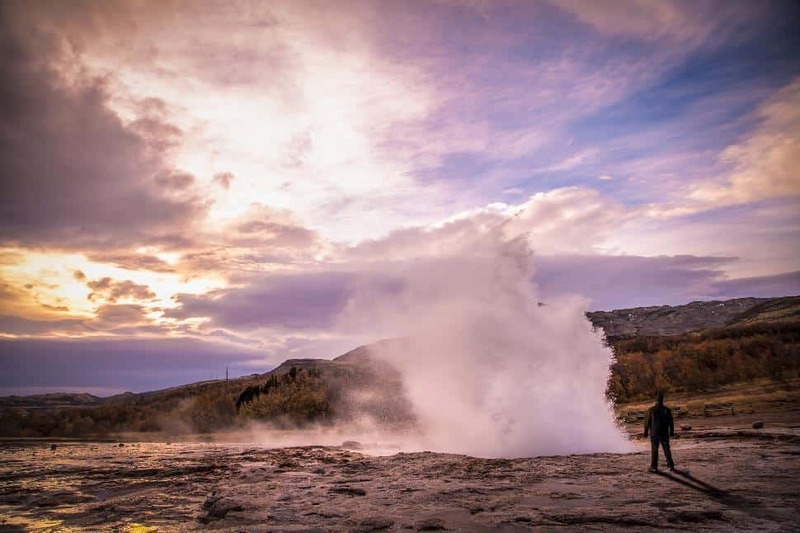 Just 50 meters from Geysir, the site for which all geysers of named (although it is rarely active), the Strokkur Geysir has been a beloved attraction in Iceland since the site was "unplugged," so to speak, by an earthquake in 1896. There's no waiting around for eruptions at this particular geyser. Its eruptions occur in intervals of five to ten minutes. Usually, it erupts in large single bursts that can reach heights of up to 30 meters, but bursts in rapid succession have occasionally been reported. Visitors should stick around for a few minutes after the eruption to watch the water pool miraculously refill after being completely emptied by the blast. 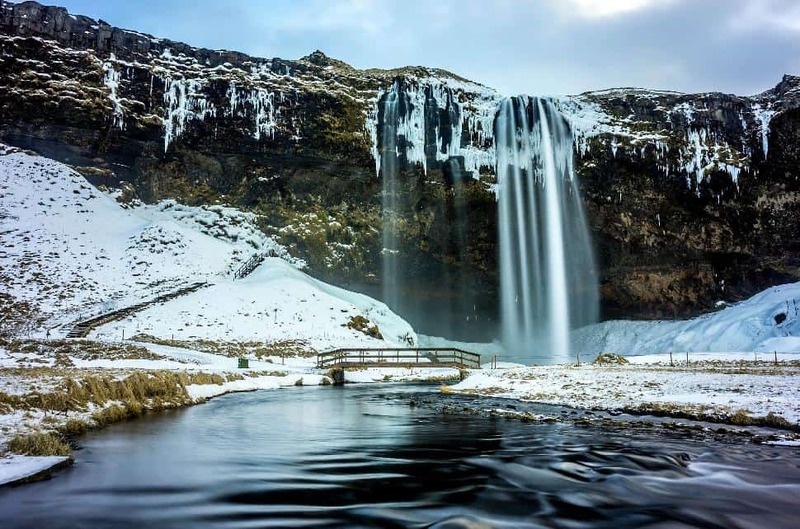 Located in between the Skogafoss and Selfoss waterfalls, the Seljalandsfoss waterfall is said to be one of the most photogenic waterfalls in Iceland. This remarkable 60-meter high set of falls makes for an unforgettable sight. The lush green plains and moss-covered mountain that hosts the falls combined with the misty environs make for one unparalleled setting. Many visitors have compared it to being in a fantasy setting rather than something that could be in the real world. The glacier-fed water and mist from the falls are icy, but visitors can walked behind Seljalandsfoss, making every angle of the falls open for view. Due to Iceland’s northerly location, the country experiences 24 hours of sunlight during June and July.